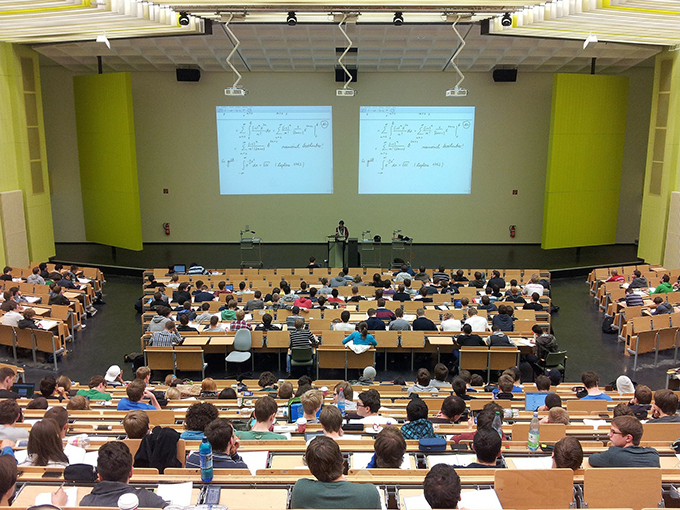 There has been quite a lot of discussion in the Times Higher Education over the last few weeks questioning the purpose of lectures at university. As my contribution, I would like to advance a rather unfashionable view, but before doing so let me say what I don’t think they are for. Robert Reid argued that “the ‘sage on the stage’ is gone and today the faculty member is really a facilitator of a learning environment. They are not the source of information – the information is out there. Their job is to help students assimilate and figure out what does it mean [and] how do we use it.” This seems a very dubious line to take – the information has been “out there” ever since the library was invented, so lecturers are no more of a required source than they were centuries ago. Amanda Fulford and Áine Mahon also pushed back against the “sage on the stage” image of a lecturer by pointing out that a good lecture is not a passive experience for the audience, but involves a dialogue between audience and presenter. This is clearly true. As in any live event, the presenter picks up on feedback from the audience – and adjusts their performance accordingly. We even go further in many of our lectures by using audience response keypads to engage directly, without the barrier of having to raise a hand in a large audience; these work very well in providing immediate feedback on how well a concept has been explained, but also help maintain the attention of the students by requiring them to think rather than just passively absorbing. However, I would argue that “dialogue” is not really the appropriate description, in that the vast majority of the information flow is in one direction. So what is the point of a lecture? To be honest, I think it is something rather simple. It is to impart knowledge the lecturer currently has but the students do not, through a narrative that is more entertaining than reading the same material out of a book. So, when lecturing, I am not a sage on a stage, a phrase that is clearly intended as deprecating as well as being conveniently alliterative. I am, hopefully, an entertaining storyteller, which also sounds deprecating, but I don’t think it is. Sometimes the entertainment in lectures is intended to be explicit (I have been known to juggle or do the occasional magic trick! ), but more often it is about being an engaging raconteur, who presents what can often be rather dry material in a structured narrative, putting across not only information but also the thought processes by which such data are processed. This certainly isn’t an original idea – storytelling dates back literally as long as history, with important knowledge and wisdom passed down between generations through this mechanism, with an equally longstanding focus on the importance of such stories being sufficiently entertaining to keep the audience engaged. The advent of books and the internet meant that there were other channels through which such knowledge could be imparted, but that didn’t mean that storytelling disappeared – even today there are plenty of television documentaries and YouTube videos presenting information on everything from prehistory to particle physics that one could read in a book or on Wikipedia; many people just prefer being told a story. Don’t get me wrong, I certainly don’t think storytelling is the only, or even the primary, way to teach a subject like physics. We have an open-door policy so the students can drop by to ask questions about lectures. We give them the text books they need to read the story for themselves, and often see an alternative perspective. We have problem classes and coursework that allow students to flex their intellectual muscles on the pieces of physics that have seen presented in lectures. We have laboratory sessions in which they can carry out the experiments they hear about for themselves, and push on to make discoveries of their own through project work. But it is an important element of teaching, and, notwithstanding all the fashionable chatter about flipped classrooms and student-led learning, its role is not disappearing anytime soon. As a lecturer, I am delighted that part of my job is telling stories – and I hope that the students enjoy hearing them as much as I enjoy telling them. Author Bio: Michael Merrifield is a professor of astronomy and head of physics at the University of Nottingham.